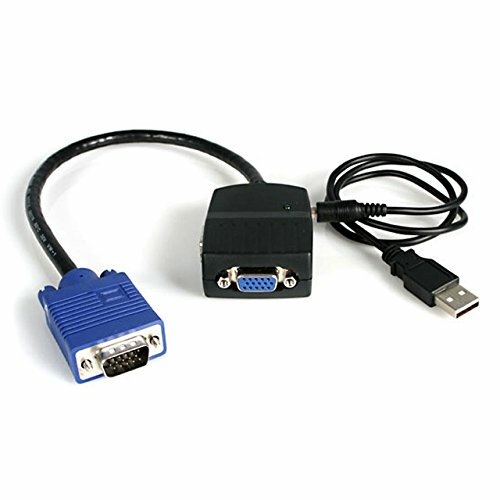 This 2-Port VGA Video Splitter allows a computer to display VGA video on two monitors simultaneously. Perfect for classrooms, tradeshows, or any environment requiring high quality video on several monitors, the ST122LE VGA splitter supports displays with up to 300 MHz of bandwidth and up to 2048x1536 resolution. Plus, to simplify placement of your VGA displays, the splitter features a built-in booster circuit that allows you to locate VGA monitors up to 200 ft away from your system, and can be powered through a USB connection to the host computer, eliminating the need to find an available power outlet. Application Diagram The ST122LE VGA Splitter supports easy plug and play installation, and is backed by StarTech.com's 2-year warranty and FREE lifetime tech support.